Who is actually in the zoo exhibit here? As I was sitting at my desk a something moving caught my peripheral vision. When I looked over I saw this guy just chilling and peaking into my office. With the little park beside the building, with the rocks and trees, and the blinds reminding me of bars it felt like I was observing him in his habitat exhibit at a zoo. Then it hit me that he was doing the same thing, observing a human in his office exhibit (where sometimes I feel like I live unfortunately). I’m not sure sure what I should’ve felt when this dawned on me, but it left me slightly perplexed. 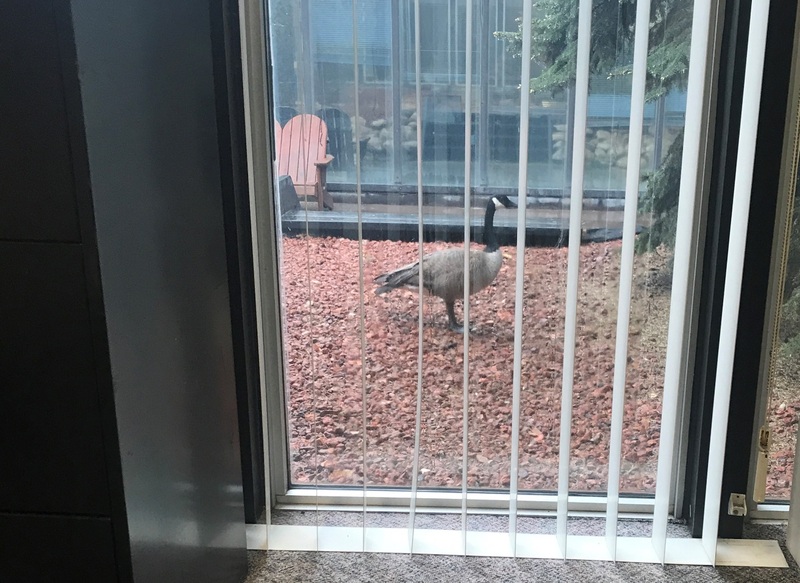 This entry was posted in Miscellaneous and tagged Goose, Office. Bookmark the permalink.